It’s pretty amazing that we can still go to see a Beatle in 2018. Ringo Starr brings his All-Starr Band to the Morris Performing Arts Center in South Bend on Sept. 9. The always-charming drummer has a ton of fun with his celebrity bandmates in a revue of Beatle tunes, hits from Ringo’s solo career, and good rollicking cover songs as well. The 2018 incarnation of the All-Starr Band includes Colin Hay from Men at Work, Steve Lukather from Toto and Gregg Rolie from Santana and Journey. Coming to the Morris on Sept. 12 is bluegrass superstar Alison Krauss. She has been a prolific recording artist, made vital contributions to the now-iconic “O Brother, Where Art Thou?” soundtrack, and has taken home an incredible 27 Grammy wins (on the strength of 42 nominations.) One of the biggest things to come from Seattle after Nirvana was Modest Mouse, who visit the Morris on Sept. 24. Modest Mouse has been around since 1992, and pulled off the rare feat of maintaining an equal popularity among fans and critics. For tickets or more information, call 574-235-9190 or visit www.morriscenter.org. Dennis Gamble plays trumpet with the Indiana University South Bend Concert Band at last year’s Community Foundation Performing Arts Series at Chris Wilson Pavilion at Potawatomi Park in South Bend. This year’s events at the Community Foundation of St. Joseph County Performing Arts Series wind down with two of the biggest shows of the season. All the family-friendly events are free at the Chris Wilson Pavilion at Potawatomi Park in South Bend. 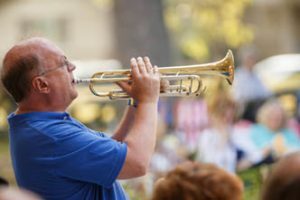 The largest crowds of the series tend to show up for the annual performance by the South Bend Symphony Orchestra, playing Aug. 18 this year. The outdoor venue allows for the extra space required for the traditional “community play-along” number. This year, local amateur musicians can register to download, practice and rehearse a special arrangement of Beethoven’s “Ode to Joy,” which they perform alongside the professional SBSO musicians at the concert. The rest of the SBSO program consists of chestnuts and warhorses from the classical canon. The series concludes with an evening showcasing the Indiana University South Bend. On Aug. 25, catch the South Bend Symphonic Choir as well as a chance to hear a piano performance by virtuoso Tanya Gabrielian. Last year, Gabrielian was named the new Martin Endowed Professor of Piano, replacing the legendary and beloved Alexander “Lexo” Toradze as the director of the prestigious international Piano Studio at IUSB. To learn more about the series, call 574-232-0041 or visit www.cfsjc.org. The area’s hippest jazz club is Merrimans’ Playhouse at 1211 Mishawaka Ave. in South Bend. The venue regularly pulls in Chicago stalwarts and even national and international touring acts. Guitarist Goran Ivanovic brings his Balkan jazz to Merrimans’ on Aug. 18. Also appearing in August: Javier Red, Aug. 24; and Juli & the Kellys, Aug. 29. A busy September features the Scott Routenberg Trio, Sept. 7; the Gregory Dudzienski Group, Sept. 13; saxophonist Caroline Davis, Sept. 22; and the Heartland Trio, Sept. 28. The brilliant young pianist Ben Rosenblum will perform with his trio Oct. 12. Merrimans’ Playhouse also hosts a weekly jam session every Tuesday night. To learn more, call 574-329-3430 or visit www.merrimansplayhouse.com. The University of Notre Dame’s DeBartolo Performing Arts Center is kicking off its 2018-19 Presenting Series with a showcase by Todd Rundgren, who has partnered with Notre Dame on a series of projects in recent years. On Sept. 7, he leads a show titled “Todd Rundgren’s Play Like a Champion Concert: Students Play the ‘80s.” Singing-acting double-threat Kristin Chenoweth, a pint-sized person with a larger-than-life personality, performs Sept. 21. Why is trumpet star Arturo Sandoval doing a Christmas concert Sept. 28? It’s because his new Christmas album features the Notre Dame Children’s Choir, and this concert is the release party. Finally, Aquila Theatre moves in for a two-night run of a theatrical adaptation of Mary Shelley’s novel, “Frankenstein,” Oct. 4-5. For tickets and other DPAC performances, call 574-631-2800 or visit www.performingarts.nd.edu.